The Togolese goalkeeper has endured a tumultuous international career that has been consistently simmering for the last 7 years, but has had another very good season with storied Stade Reims at club level, reaffirming the belief that he is arguably the best goalkeeper Africa has to offer. ‘Magic Hands’ has been the undisputed number 1 with the newly promoted side, transmitting Kossiness to a defence that, conceding just 42 goals and finishing as the 7th meanest defence, has been economical enough to survive at the first time of asking despite being frugal in front of goal. It’s now two consecutive Turkish Super League titles for the alacrity-filled right-back. The defensive frailties still remain, as does the whimsicality which has made him one of the most loved players in the game, but his five assists from right-back portray that the sojourns into opposition territory are becoming increasingly fruitful. The right-back has been ushered to the periphery at international level after an indifferent Afcon and speaking out against the Ivorian FA, but on current form he will be difficult to ignore. In a Marseille side that has bored opponents and everyone into submission, Nkoulou has unquestionably been their most aesthetically pleasing player – and their best. Nkoulou stands at a mere 5’10”, but who needs height when you can read the game so magnificently, as if rereading your favourite book for the umpteenth time. He has formed a formidable centre-back partnership with Lucas Mendes that saw them go almost 2 months without conceding. It’s easier to defend when you’re scoring so many, but to score only 42 goals and concede 35 – meaning having to be under the duress of squeaky-time almost on a weekly basis – and automatically qualify for the Champions League is an incredible achievement. The uncompromising defender continues to cement his place as one of Africa’s most consistent defensive exports of recent times. The maths does all the talking: Fenerbahce conceded 19 goals in 20 games with the Nigerian Afcon captain at the heart of their defence but, in contrast, conceded 18 goals in 14 games when he was absent. Although more accustomed to playing in central midfield, Asamoah uncomplainingly accepted his deployment at left wing back in Juventus’ 3-5-2 system as the Bianconeri retained their Serie A title in his debut season for the club. An eager student of the game, simply putting in a shift wasn’t enough for the gregarious Ghanaian, so he learned the intracacies of his position – seeking one on ones, beating his man, etc. The manifestation of that was his tendancy to regularly beat his man, one of the features of Juventus’ attacking plays. Lille would ultimately narrowly miss out on European football, but Gueye’s introduction to the team after an injury to Rio Mavuba was one of the main reasons for their resurgence in the second half of the season. The 23-year-old has steadily clocked up his footballing footprints since joining Lille, but this has surely been his breakout season. Alongside the pipsqueak Florient Balmont, he has been the playbreaker who has ensured respectability has been restored in Lille’s defensive system with his simplicity and spatial interpretation. A hasty look at the Ivorian may exude the impression that he is a fan who has won a competition to play a match. A large part of that is due to his modus operandi on the pitch: he is a hard-running, scythe-tackling enforcer who patrols the pitch with grit and determination, a grimacey type who leaves the aesthetes wincing. The performances to Die for with Basel, particularly in the run to the Europa League semi-final, have seen him force his way into the Ivorian set-up, delivering a committed display which saw him substituted to a standing ovation on his debut v Gambia. The Stuttgart winger was one of the outstanding youngsters at the 2012 Cup of Nations, dazzling the tournament with his penetrative, relentless running. Part of a core of quicksilver attacking Guinean players, the winger would fail to quality for this year’s tournament after a shock play-off defeat to Niger. Yet that disappointment has been channelled into maturity at club level despite being in a Stuttgart side that has, at times, struggled for form. Blessed with the ability to regularly beat his man, Traore has been one of the best wingers to watch this season. This is the season Aubameyang morphed from a good player to a very good one – or at least one who was undisputedly ready for the big ride. With 19 league goals to last season’s 16 and the same number of assists with 9, the numbers suggest a subtle improvement but the omnipresent aura that is proliferating is something that’s unquantifiable unless we incorporate achievements – Marc Vivien Foe Prize (Best African player in Ligue 1), a nomination alongside Zlatan Ibrahimovic, Thiago Silva and Blaise Matuidi for Ligue 1 Player of the Season and setting a new Ligue 1 record by scoring in 7 consecutive games. Coming in at just 5’7”, Ahmed Musa certainly doesn’t depict the quintessential Nigerian striker that is perpetually engraved in our retinas, but a troublesome back injury to team-mate Seydou Doumbia saw CSKA Moscow convert the promising winger into an emergency striker. Thanks to Musa’s 11 goals, CSKA would barely grieve during the eight-month absence of Doumbia as they won a league and cup double, continuing to play the Nigerian even once Doumbia was fit to start. Systematically, his dynamism gave CSKA more or a less a 4-6-0 system that, at its best, devastated the train of thoughts of centre-backs. Daddy Cool just keeps getting cooler. Unorthodox in the way he combines top-heaviness and acceleration in short distances, his 31 goals amassed in 30 games this past season helped Vitesse Arnhem to qualify for the Europa League. With the Ivory Coast having started the arduous process of easing Didier Drogba out, Bony may not fill the grandiose shirt but it was no surprise to see him get first dibs to the single striker role in March. 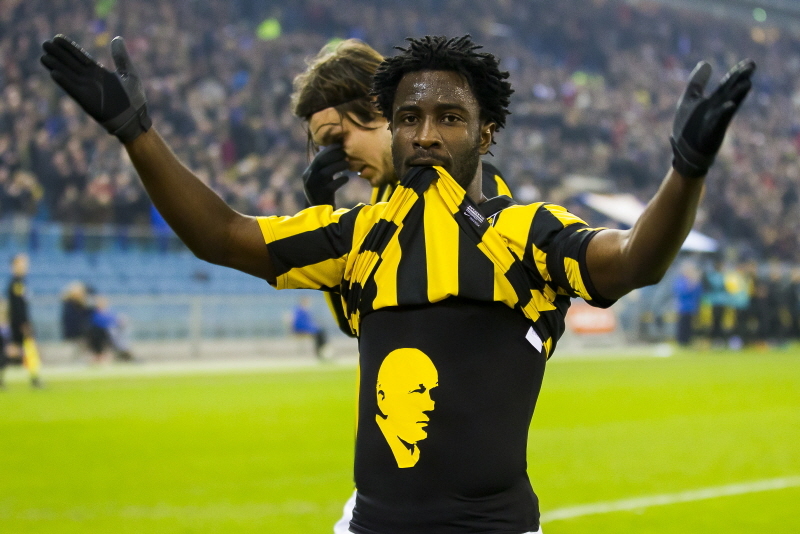 With mammoth Dutch Eredivisie goal-scoring figures rightly looked at with incertitude, the next step for Bony is to prove himself in a bigger league. Honorable Mentions: Boubacar Barry, Ludovic Sane, Aymen Abdennour, Mehdi Benatia, Victor Wanyama, Mohamed Diame, Mubarak Wakaso, Mohamed Salah, Saber Khlifa, Dieumerci Mbokani, Rafik Djebbour, Kalu Uche. Emenike hasn’t had as good season at club level as Bony, same goes for Mbokani.